This song was everywhere during my first trip to China in Phase I. It was blasting from every other storefront, sung by teenagers walking down the street and playing every time I turned on the TV. S.H.E., a Taiwanese trio formed from the winners of a singing contest, was huge in China. Although this is the only song I heard of theirs they have apparently released ten albums and amassed 4.5 million in sales. That’s no flash in the pan. If there’s one song that reminds me of my recent travels in China it’s Ji Xiang San Bao. During 2004’s Phase I, a handful of pop songs were constantly blasting from storefronts. There was no song that assaulted me at the same level during Phase II. In fact, the area of China I visited during Phase II seemed altogether quiet compared to Beijing and Xi’an. Although Ji Xiang San Bao wasn’t blasted into my memory it quietly crept in. Walking down the street I would hear the chorus and on an overnight sleeper bus I was woken by a child’s voice squeaking out “mama?” I swear ever other man in Northwest China had this song as his phone’s ringtone. “That doesn’t sound so bad,” you might say, “ringtones usually only play for a few seconds.” That’s true in many places, but these men enjoyed the song so much they always let it play the entire length before answering their phone. See that man on the bottom checking his phone? Imagine being on this bus for 12 hours with this ringtone going off at the highest volume every ten minutes. Despite it’s popularity, I had trouble tracking down the title and musician for this song. It was given to me by a Korean tourist who had bought a Tibetan CD with the song in Lhasa. He insisted it was Tibetan but I knew it couldn’t be. I finally found out the name from an English traveler I met in Kyrgyzstan who’s now living in Beijing. It’s always nice to have friends around the world, thanks Gabriel! During my research I discovered that the song initially gained popularity in 2005, spreading around the internet. Some sources call it a “traditional Mongolian ballad” but it’s origins are not clear. Burenbayaer may be from Inner Mongolia, a province of China. The version I’m giving you is sung in Mongolian but I suspect the versions I heard in China were recorded in Mandarin, like parts of the You Tube videos below. This version starts out in Mongolian and then switches to Chinese (Mandarin) around 2:00. This version starts in Chinese and then goes into Mongolian around 1:45. It also has small children dressed as sheep which is always entertaining. So much time and effort has gone into my visa planning, particularly for Central Asia, that I’m surprised it’s finally time to start applying for them. Thankfully, the first two countries I am visiting—South Korea and Mongolia—give US citizens free visas on arrival. China isn’t quite so easy, and because I will pass through it on my way from Mongolia to Kyrgzstan and then again from Kyrgzstan to Tibet I need either a double entry visa or two single entry visas. Most countries issue 30-day single entry visas and anything else requires more money and information. I could certainly get a single entry visa here, at the Chinese consulate in Chicago, and then another visa somewhere in Central Asia. Technically, I could get my first Chinese visa in Mongolia, but all of these scenarios are risky. There’s the risk that the embassy won’t be open, the risk that I will have trouble applying (or even be denied) if I don’t speak enough Chinese or Russian and the risk that I won’t have enough US cash to pay. Ultimately, if I can get all of my Chinese visa needs met before I leave I will be better off. I drove down to the consulate last Thursday to drop off my application. Because I am stubborn when it comes to parking, I drove around the River North area for 15 minutes looking for a meter. Somewhere in there I ended up back on the expressway through a combination of being in the wrong lane and one way street restrictions. After doubling back into the city I decided to bite the bullet and pay for the garage. The confusion was not over, as I wandered around Erie Street trying to find the embassy. I knew the office had moved a long time ago, and I thought that the last time I was there in 2004 I was at the new building. For 10 minutes I was walking back and forth on Erie looking for a two story building on the North side of the street when the actual office was in a high rise on the South side. (2) The applicant owns real estate in China, who shall submit the original and a photocopy of the property ownership certificate. I really cornered myself in the Yunnan Province. The province?s main city, Kunming, is quite large but outside of the main highway between Dali and Kunming the roads are rough and slow. The area I was in was much closer to Laos and Myanmar than the Vietnamese border I wanted to cross. My options were to take the 12 hour bus back to Kunming and then another 12+ hour bus to Hekou (the border town) or to take a direct bus from Jinghong to Hekou which would be on rougher roads but take about the same time. I decided that I would not rather not backtrack to Kunming and bought my ticket to Hekou. It was the most difficult ticket to buy so far in China because it?s not a popular destination and none of the agents seemed to understand what I was saying or the Romanized letters (when I wrote them down) instead of the Chinese characters. Finally I found someone who explained the Hekou is not pronounced ?He-coo? but ?Huh-cow?. I have found that the Chinese are fairly insulated and not used to hearing foreigners speak Chinese. The difference in pronunciation is very small but they couldn?t make the leap. The next hurdle was to find out how long the bus trip was. I asked a few different people because you can?t necessarily trust the first person to be correct. I was told 21, 24, 26 and 30 hours. Because it was such a large range I could only hope for the best and assume the worst. After stocking up on chips, drinks and dumplings I boarded the 7am bus. 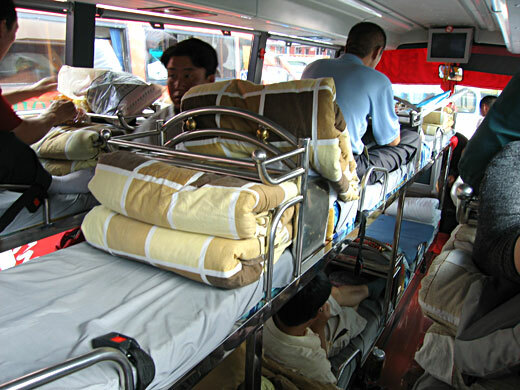 It was a sleeper bus so you sit on your bed the entire trip. My busmates were all Chinese, none were tourists. Some had no luggage, some brought 27 inch televisions. Apparently this was the only bus going in the direction of Hekou so many people got off on stops along the way–I was the only one traveling the entire distance. I surprised myself by not being bored at all. The first few hours of the trip were spent sleeping–I had stayed up late the night before downloading a new episode of one of my favorite TV shows and instant messaging my mom and friend. The rest of the day was spent reading a book during bathroom breaks. My driver and fellow passengers spoke no English but I was able to speak enough Mandarin to determine how long the breaks were and to ask where the bathroom was. Around 6:30pm the sun set and I switched from my book to my iPod. We stopped for dinner around 10pm but the restaurant was just too much. Dead, skinned chickens sat on some of the tables and I couldn?t even stay in the building. The other passengers and driver were very confused by my behavior but I just smiled and told them I didn?t want any. I slept fairly well throughout the night considering our stops in cities along the way (one at 1am to change buses when ours broke down) and the less than smooth ride. Around 6am we stopped for a very long break. Because I didn?t know how long the journey should take I wasn?t sure if we had arrived or if it was another city where we were waiting for passengers. On previous overnight trips the bus had arrived very early in the morning and were told to sleep on the bus for a while (I assume until the sun came up and hotels were open). I went back to sleep and was awakened later by the driver. He motioned for me to get off the bus, I assumed for another bathroom break, but when I looked around I was the only person left on the bus. Dawn was just breaking and the driver motioned what I thought was a coat and I told him I wasn?t cold. I soon realized he wanted me to get my bag. Finally I got my bag off the bus and was starting to get nervous. I wasn?t sure where I was or where the other passengers I had gone to. The driver pointed toward the building and I told him I didn?t understand. The pointing and confusion continued for quite a while, I had made sure a number of times that the bus I had just been on was going to Hekou. Finally I managed to get the man to accompany me to the street in front of the train station where he loaded me on to a minibus which he assured me was going to Hekou. A few hours later we stopped for lunch. I was walking down the street looking for dumplings when the driver motioned me across the road to a small restaurant. I am not a fan of noodle soup, especially for breakfast, but he seemed fairly intent on feeding me. At the end of the meal he commented on my full bowl (I had only eaten the noodles) and took me to a small shop to buy more food. I could tell he thought I hadn?t had enough but I just smiled and bought a water. Another few hours in the minibus followed along the winding roads of the mountains bordering Vietnam. We parted ways in Hekou, only a few blocks from the border crossing. After loading up on peanut butter and chocolate Oreos I made walked across the river and into Vietnam. I was immediately approached by a driver and bargained my way into a minibus to Sa Pa. After an hour circling the city in search of more passengers we headed over the mountains dropping off local tribes people along the way. All in all it was an interesting trip through small towns and different environments, thankfully my previous travel in China had prepared me for the long ride. By the end I had finished a 525-page book and learned that I can exist on chips and coke for a very long time. It?s hard to believe that I?ve been travelling for two months straight. In the grand scheme of things it hasn?t been long at all, but I imagine that it must seem like an eternity to most people back home (especially my mom). Halloween passed with no fanfare this year. People who know me well will understand why this is so devastating. I tried to buy candy but there?s not much chocolate to be seen out here on the edge of Yunnan. Out of desperation I bought a package of ?dense milk candy? thinking they just might be milk chocolate–I was wrong. Tomorrow morning I set off to Hekou, the border crossing to Vietnam. The bus will take anywhere from 22-26 hours (you never can tell who?s information is correct in China). I?m half a day ahead of the U.S. and hope to catch the tail end of some election news when I arrive the 3rd in Vietnam. Although I haven?t seen an English-language newspaper in weeks I hope someone will have satellite TV in the mountain town I?m stopping in. Please vote this year, you must understand how important it is not only at home but also out here. Bush?s policies have made my travel plans more difficult across the globe and I hear almost every day from a European who is desperate to vote. Most Americans who never leave the country don?t realize how much our election and our policy affects the entire world. In brighter news, I will be meeting up with my cousin in Hanoi for a few weeks. He doesn?t do the backpacker thing and I haven?t travelled with another person in about 6 years so it will be very interesting. I am ecstatic to see a familiar face and my parents can receive a visual confirmation that I?m still alive. Thanks to everyone that?s been following along. I have been working on the sketchbook portion of the site and hope to have that up in the near future. The route map has been updated and all of my photos from China are in the gallery. If you have any questions or problems with the site please send me an email. I am still testing just how the notification system works. I don?t believe it has an auto-unsubscribe so just let me know if you signed up for updates (the box in the right hand column) and would like to be removed. After a bumpy 12-hour night bus from Kunming to Jinghong I had finally arrived in my last destination in China–the Xishuangbanna Region. My main reason for coming here was to see the ethnic minorities in the smaller towns. Jinghong, a ?modern? Chinese city, was my base since most buses originate from there. It?s streets are lined with palm trees and Dai women with headscarves selling grilled bamboo and pineapples. I decided that a traditional market would be a good place to catch a glimpse of the minorities that live up in the hills, since they only come into town on market days. Two buses and a lot of bumpy roads later I found myself in a little town called Xiding for it?s Thursday market. Because there are only two buses a day to Xiding I went Wednesday night and stayed at the only hotel in town attached to the bus station. A Belgian couple joined me, bringing the total number of tourists to three. The night was very dark and completely still, we had to hunt down instant noodles for dinner at 7pm because all of the restaurants had shut down. Thursday morning we were jarred from sleep by loudspeakers that had been installed on the hilltop overlooking town. What I can only assume was propaganda continued for two hours. When I finally walked down the road to the public toilet I was surrounded by women in red and white headscarves and blue aprons–the market was in full swing. Breakfast was a bowl of noodle soup across from an old Hani woman with no front teeth. Keeping it down was difficult when I stepped out into the meat section of the market where blood splattered the street and pig heads littered the tables. The market was entirely local, full of things locals need like shoes, vegetables, Chinese pop CDs and toilet paper. I walked around, noting the different groups of women with different costumes. The most surprising thing to me was that these woman were not dressed up for tourists, they regularly wore large, elaborately decorated headdresses to market. I took some wonderful pictures of the costumes and most people didn?t make a fuss about me if they noticed me at all. The women didn?t object to me drawing them but seemed unaffected when I showed them the end result. It was refreshing to see the locals in their own environment, interacting with each other and having a good time. Traveling across China I have encountered large areas where the indigenous people are not Han Chinese. It?s sad to see how Beijing has ?colonized? these areas by injecting Chinese-style tile housing and tearing down all of their religious structures during the Cultural Revolution only to rebuild them for Han tourists now. I only foresee this forced integration getting worse in years to come as China continues it?s mad dash to become the next superpower. I can now say that I?ve traveled by hard seat in China. Hard seat is basically the lowest class of travel by train. The seats aren?t terribly hard–they could be wood. But 7 hours sitting on a bench in-between two middle age Chinese men and across from a couple that fought the entire trip was something that I don?t feel the need to experience again. I didn?t want to call more attention to myself, I was the only foreigner as far as I could see, so I didn?t listen to my iPod of pull out my camera. At this point in my travels across China I?ve become so accustomed to long distance travel that I?ve been able to pass 6 or more hours with nothing to amuse myself. It?s almost as if you have to put yourself in a meditative state or you?ll go crazy. I know I was a constant source of entertainment for my seat mates–they watched intently as I ate my instant noodles and tried to engage me in conversation no matter how many times I told them I didn?t speak Chinese. After they seemed to accept that I didn?t speak Chinese they tried writing things out for me in Chinese characters. They were even more confused when I told them that I don?t understand Chinese writing. It?s just like all of the newspaper sellers and and people who hand me pamphlets–it doesn?t occur to them that I wouldn?t read Chinese. Kunming is a big city where people go to get things done. You can get a Laos visa here or check up on the latest border openings to Myanmar. I went to Kunming to go to the post office. That may sound silly to most people but you really need to go to an international post office to mail anything bigger than a postcard and you might have to travel 25 hours by train to find one. I mailed postcards from the worst possible place, Xiahe, and a month has passed with no sign of them. I have intentionally avoided buying souvenirs because they take up space and usually aren?t something you?ll use or want when you get home. I once carried a saz (banjo-like instrument) all the way across Turkey and Greece for my brother and he never played it. This time I?ve been carrying two Mao propaganda posters around for a month and I was more than ready to get rid of them. Unfortunately, China has not yet discovered the practicality of mailing tubes so I was forced to carry around a water-damaged paintbrush box which became less sturdy with each bus or train I got on. By the time I got to Kunming its? sides no longer formed 90 degree angles. China Post does a great job by supplying boxes and thermal bands that seal them tight. The postal woman was annoyed with me for filling the empty space of my box with newspaper and even more so when she realized that I wrote the address upside down. It really shouldn?t have mattered that I wrote it upside down–besides, that?s the way she gave me the box–but she went around and scribbled everything out while giving me the evil eye. (She really resented the fact that I wrote ?up? on every side.) Hopefully my box full of posters, guide book, maps, Tibetan belt and so on will arrive at home in the next few months. While I was spending a few days in the cleanest hostel in China I spent my time seeing King Arthur (in English! ), eating sandwiches (with bread! ), trying on more clothes (that don?t fit) and getting a blind massage. The traditional massage in China is done by blind people, as they are meant to have a better sense of touch. I?m not especially fond of strangers touching me but I decided to give it a chance and see what the fuss was about. You lay on a bed with all of your clothes and covered by a sheet or two. I?m not sure how much they can feel through so many layers but I was really happy to have it there when he proceeded to give both of my arms what felt a lot like Indian rug burns. I was in dire need of a back massage and although the elbows digging into my muscles hurt it did help to get some of the knots out. The worst part was when he massaged my face and temples, I would have told him to stop if I had thought of a nice way to say it in Chinese without offending him. At 20 yuan an hour ( a little over $2 U.S.) you can?t complain too much. I decided to go straight to the Xishuangbanna region near the Myanmar and Laos borders instead of trying to visit the Western Dehong region as well. The main reason for this was the 40-hour bus ride between the two. The small gauge railway between Kunming and Vietnam is shut down for repairs and the roads in the region are mostly rock and mud, resulting in some really long bus rides. It seems as if anywhere off the main rail lines travel is slow and I need to figure out how I?m going to get from Jinghong (in Xishuangbanna) to the border crossing with Vietnam. Dali wasn?t somewhere I really wanted to see but it seemed like a good enough place to stop. Only 3 hours from Lijiang, the minibus passed large fields with people working, picking crops by hand. The actual town doesn?t have much to see, only a few town gates which are being recreated (along with the city walls) for tourists. small, rounded mountains flank one side of the town and a large lake dotted with small nondescript villages. Like Lijiang, there were plenty of English menus with pizza and pasta. I even splurged on a ?milkshake? even though I should have known better. In all of my travels I have never found a good milkshake outside of the United States. Even the ice cream here is a bit… off. The ?milkshake? turned out to be chocolate milk that was shaken, no ice cream. Aside from eating and looking in awe at the shops with imported hip hop clothes and music I finally found a deck of the cards I?d been looking for since Chengdu. From Chengdu to Kunming I saw everyone playing a card game with long, thin cards. They had symbols or characters on each side and they were held in one hand like a Western set of cards. I have no idea of to play but wanted them for their graphics. I asked a girl working in my hotel in Lijiang to write the name down for me but when I went to the store I was shown everything from paper cups to an electrical outlet. Once I figured out what type of store sells them (stationary and sports/games stores) I found plenty of cards. The sales girl probably wondered why I was so excited over a pack of 4 yuan cards. On my first full day in Dali I had planned to take the chairlift up the mountain and walk around the top between a number of temples. I soon found out that the paths on the mountain were closed so I took a local bus up to a town on the lake with an English girl I met at the hostel. We were at very different places in our trip–I?m just starting out and she?s heading home in just a few weeks. My map showed the town right on the lake but we couldn?t find it anywhere. Little kids we asked around town pointed us around in circles until we finally came upon the water?s edge a few villages away. It was pretty, but not much of a destination. We wound our way through more villages with surprisingly no tourist stands and were greeted with genuine smiles from the farmers. Because I had no intention in getting in a boat on the lake I decided to leave Dali before I ate too many french fries and got spoiled. Lijiang is a smaller town dubbed ?the Venice of China? because of it?s many canals, stone bridges and cobblestone alleys. The journey here was interesting–a 12-hour train ride from Emei into the Yunnan Province followed by a breathtaking and often terrifying 8-hour bus ride over the mountains. The usual bidding war over me, the only Westerner to get off the train, occurred at 5:30am between a female taxi driver, chain-smoking mini bus driver and various old ladies selling dumplings. I eventually got to the bus station after a very long taxi ride where I wondered more than once if I was being kidnapped. The woman had shown me a note in English with the distance but I still haven?t bothered to learn just how far a kilometer is. The bus should have been an opportunity to catch the sleep I didn?t get on the train because of my snoring bunkmates but it started with loud Chinese ballads over the speakers and ended with even louder techno accompanied by a video of exotic dancers. I arrived in the rain but the next two days were beautiful and clear. The old town must have been truly stunning before it was sterilized for tourists. As it stands now every single building in the old town is either a hotel, restaurant or souvenir stand. It?s too bad really, because the cobblestone streets combined with the rushing water in the canals and red lanterns at night combine for a magical atmosphere. I?m not embarrassed to admit that my decision to stay for three nights was a bit influenced by the many restaurants with good Western food. For a town so far out of the way it really has embraced Western tourists, even if we are outnumbered drastically by Chinese tour groups. I?ve managed to eat warm apple pie, an omelet and buy two **good** English-language books. As you can tell, Lijiang has allowed for splurging. My first hostel was only 20 yuan a night (a little over $2) but I decided to go upmarket and found myself a single room overlooking a canal with a TV for twice that. Aside from wandering around the old town alleyways there?s not much to do in Lijiang. I walked up to a beautiful park north of town with a lake, temples and bridges with a great view of the snow capped mountain outside of town. Today was spent biking out to a smaller town called Bai Sha where I met with the local celebrity, Dr. Ho, who mixed me some herbs for the cold which has stayed with me since Xiahe. The townspeople were out in their fields harvesting corn and carrying the husks back to town in the baskets on their backs. The minority group in the area is called Naxis and is the last surviving matriarchal society–the woman did appear to be doing all the work. Although I wanted to see Tiger Leaping Gorge I?ve decided to skip it. A lot of people have said it was their favorite part of China but I?ve heard drastically different reports on condition. Some people have told me that it?s difficult and if it rains the path gets washed away by waterfalls. However, some people have told me that it?s very easy and completely safe. My legs are still aching from my one day stint on Emei Shan so I?m going to head on down to Dali and get some information on possible routes to Xishuangbanna and on to the border crossing with Vietnam. I?ve heard the train line from Kunming is not longer running but I?m not quite sure if it?s possible to head East from ?banna or if I will have to backtrack 17 hours on the bus to Kunming. It?s not really getting any warmer as I head south. I?m still carrying around the coat I bought in Xi?an and the scarf and hat I bought in Xiahe. My first short stop from Chengdu was Leshan, a town which is overpriced and moving as fast as it can toward Westernization. Towns like Chengdu and Xi?an are already very Western with McDonalds and skyscrapers but they still have a few pockets of traditional buildings. Leshan consists mostly of large tile-covered ?modern? buildings. The town has one tourist attraction–the largest Buddha in the world. Since it was declared a UNESCO World Heritage Site prices have doubled and it?s nearly impossible to see the Buddha through the swarm of Chinese tour groups. I took the ferry to the far island and made my way through the temple complex to the other island where the Buddha is. The tourist literature proclaims ?The mountain is the Buddha! The Buddha is the mountain!? Which is true in a way because the Buddha is the entire height of the mountain, but I wouldn?t exactly call it a mountain–it?s more like a large hill. Still, it is impressive when you get up close to it. A small path has been carved into the side of the hill so tourists can walk from the head down to the feet. I fought my way through the tour groups to the first viewing platform but couldn?t get any further. People were shoving each other to get to the railing and I decided that although eventually I may be able to fight my way down I may get hurt in the process. I waited back at the top for the tour groups to disperse but they just kept coming. After a while I gave up, went back to town, ate some dumplings and caught a quick bus to Emei Shan. Mount Emei, a holy Buddhist mountain, is only 40 minutes from Leshan. A lot of people hike the entire route to ?The Golden Summit? and back down again over the course of 2-3 days. However, I decided that one day of hiking was enough for me and took a bus halfway up the mountain to start. The mountain is covered with temples interconnected with stone steps. There are very few flat surfaces, you spend most of your time walking up or down steps. I started at a nice but overcrowded temple called Wannian Si. It had some interesting statues of Buddha riding an elephant and distinctive architecture. I watched in amusement as the Chinese tourists were taught how to pray and bow with incense by their tour guides for their photo op. Following the crowds I walked down toward another small temple sitting over a waterfall and further on to the ?joking monkey zone.? Mount Emei has a lot of indigenous monkeys. They?re quite small and harmless but tourists find them extremely entertaining for some reason. I quickly headed back up the mountain to a small Monastery called Hongchunping. Along the path I only saw a handful of people and I was finally able to enjoy the trees and streams. The monastery wasn?t especially impressive but I was happy to get away from the crowds. Just below the site was a small shack where a friendly woman cooked me fried noodles with vegetables while I watched a Chinese soap opera on her satellite TV. She seemed very pleased with me and my interest in her little white dog named Toto. Walking back down the steps wasn?t as difficult but when I got to the path that could lead me down to a bus or across to more temples it started to rain. Apparently I was very lucky because it appears to rain here most of the time. Overall the mountain was unimpressive but worth a day if you have the time. I am not sure which route I will take over the next few weeks. I have a 12-hour train tonight followed by a 6-hour bus ride to Lijiang in the Yunnan Province. After that I may head north to Tiger Leaping Gorge if I?m feeling athletic. I would like to see a number of areas in the South and Western areas of the province but am torn between spending a lot of time there and heading into the northern area of Vietnam or heading all the way out to Yangshuo near Guilin.